Worried about how you're going to make the Whole30 work Here are the products that might make life a little easier during the Whole30. If you've been around this blog for even a millisecond, you will quickly realize that our family does a lot of Whole30 and paleo-type eating. We aren't fanatics, we just eat what works for our family. If you're missing spaghetti, then you need this gadget. Will zoodles (zucchini + noodles) taste the same as real, carbohydrate noodles. Um, no. But it's a good substitute! Slow cookers in general just make life a lot easier. Busy school or work nights will thank you for planning dinner ahead of time with a gadget like this. I personally love this Rosemary Garlic Beef Stew recipe for the Whole30 and just remove the non-complient ingredients. It still comes out tasting great! Spaghetti squash. Those are the only two words you need to hear to understand how badly you need sharp, durable knives in your kitchen. The Whole30 and Paleo diets require a lot of fresh veggies and those veggies require a lot of prep. Please don't use cheap knives. Please don't undercook your meat and get salmonella. Yuck. Am I the only one who thinks Brussel sprouts turn out amazing every time they're cooked in a cast iron skillet? My Dad gave us one when my husband and I got married. Even though I kind of chuckled at the time, (Me?? Cook??) I've been using it ever since then. Thanks, Dad! I'm not the best vegetable peeler with a regular knife. I waste too much! Peelers are necessary in my healthy kitchen. I love to make "cauli rice" but used to do it with a regular flat grater. That cauliflower would fly everywhere and was a pain to clean up. I just don't have time for the extra mess. Use this boxed grater to keep the chaos contained. When I first purchased baking sheets, I grabbed the ones without the raised sides because I thought they looked sleek and modern. Obviously, I knew nothing about roasting vegetables because I would've known what a terrible choice I had made. Save your veggies from flying off into the depths of your oven by purchasing baking sheets with some sort of protective wall. Unless you have incredible chopping and blending skills by hand, you're going to need one or both of these. I just don't have the time to do that kind of heavy lifting...oh and I'm also very bad at chopping things into tiny pieces. 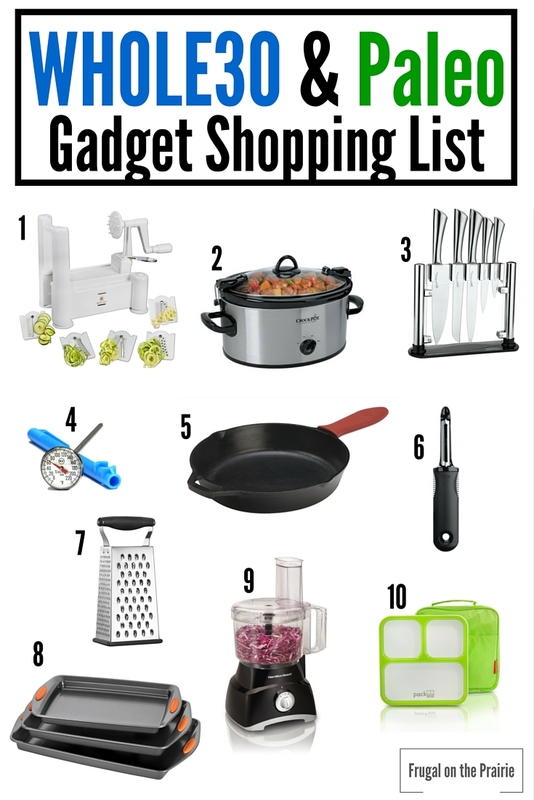 This may be listed as last but it's probably one of the most important gadgets on this list. Why is it so hard to find on-the-go food storage options for working or busy men and women? You can only pay for so many overpriced salads before you decide to bring your own lunch into work (or in my case, send lunch with your husband). Eating healthy is only as fun as the gadgets you use to make your meals. I look forward to making a delicious meal when I know I have good knives to chop the veggies and sturdy baking sheets to roast them in. What are some of your favorite kitchen gadgets?